Home Latest Event Asian Pop Expo 2012 this September! Asian Pop Expo 2012 this September! From the team that brought you a successful series of Pop Culture events in the Philippines, Hobbiworx Inc. (TAGCOM , Philippines Cosplay Convention, COLLECTICON) is proud to present, ‘Asian Pop Expo' for the second time around. 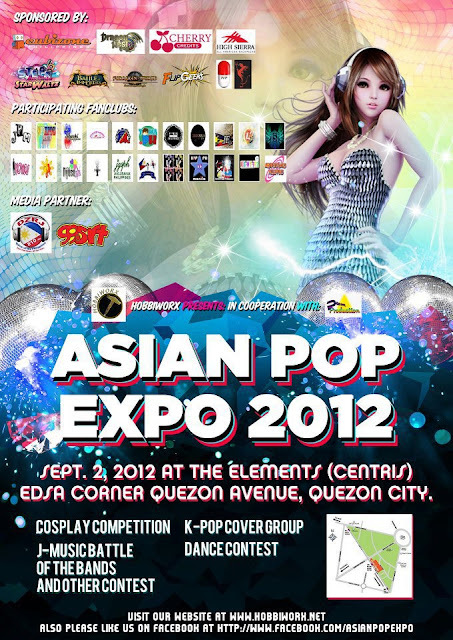 We are inviting all Asian Pop fans, cosplayers and enthusiasts to come and join to this year's ASIAN POP EXPO 2012 after last year event. Our event will be happening on September 2, 2012 at Elements at Centris, Edsa corner Quezon Avenue, Quezon City.